"Eggplant, mushrooms, and zucchini are roasted together with a touch of tomato for a surprisingly robust side dish or sandwich filling." 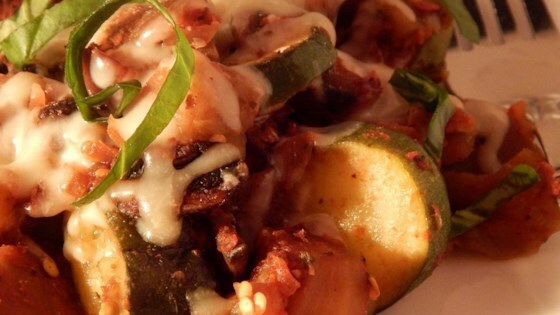 Place eggplant, zucchini, onion and mushrooms in a 2 quart casserole dish. In a small bowl combine the tomato paste with the water, and stir in garlic, basil, salt and pepper. Pour over the vegetables and mix well. Bake in preheated oven for 45 minutes, or until eggplant is tender, stirring occasionally. Add water as necessary if vegetables begin to stick; however, vegetables should be fairly dry, with slightly browned edges. See how to make autumn's perfect side dish. You can add a little zip to this by increasing garlic, adding some freshh Romas quartered, and some crushed red pepper.